Best surface to use for large soft pastel painting? Reader Question: What is the best surface to use for a large pastel? Can you recommend a type of paper or board for a large soft pastel 33" x 24"? Does it need to be dry mounted first or after? Also, what do I need to advise the person commissioning this artwork with regard to care and framing technique for a large painting of this size in pastel? For a large pastel artwork at that size, I'd recommend using a board or canvas over paper, both of which are more stable and durable. If you did decide to use paper, it would need to be dry mounted onto board before you begin drawing. 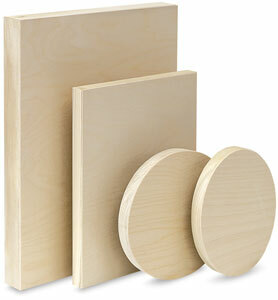 If your artwork must be exactly 33" x 24", you should choose either canvas or wood panel. If you have some flexibility with the size you can take an easier approach and use a board designed specifically for pastels, like Ampersand Pastelbord. Let's discuss your options. For large artworks that require custom dimensions, canvas is always a good option because it can be sized to fit, and even if the artwork is huge, it'll be much lighter and easier to move than a wood panel of the same size. You can buy pre-stretched canvas (which I prefer), but if you can't find the exact dimensions you're after, you can stretch it yourself. Before you use it, you should prime it with gesso and then coat it with Pastel Ground which will provide tooth and make the surface receptive to pastels. 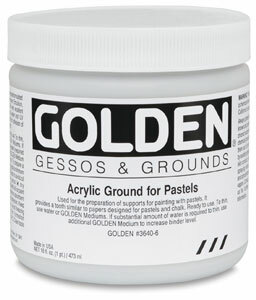 I wrote an overview of how to use Golden Pastel Ground on another page to answer a different question, but reading through the instructions may be useful in helping you decide what support to use for your large pastel artwork. Wood panels are another option if you require exact dimensions. You can purchase thin birch plywood (or something similar), cut it to size, and then brace it with thin strips of wood on the reverse to prevent the board from warping. American Easel Wood Panels are a good choice because they're cradled with a solid wood frame, which means they don't need extra bracing. Like with canvas, you'll need to prime it with gesso and pastel ground before you start work. Wood panels are usually cheaper than canvas, but much heavier and harder to move. If you're allowed any flexibility with the dimensions of your artwork you should look into boards or panels designed specifically for pastels. 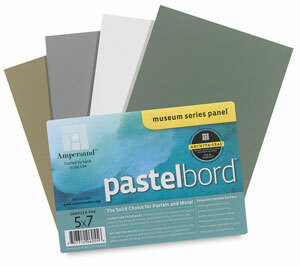 My favorite is the Ampersand Pastelbord which is a professional, museum-quality board available in sizes up to 36" x 24". Pastelbord is made from warp-resistant hardboard that is coated with a textured kaolin clay ground, so it's ready to be used with pastels straight out of the packaging - you don't need to prep the surface or anything. I've used Pastelbord for smaller pastel paintings and really loved it! In between finishing the pastel artwork and having it framed, it is important to keep the pastel artwork as safe and secure as possible to prevent smudging or other types of damage to the art. Be sure that your customer knows how fragile pastel artwork is. Remind them to always handle the artwork with care, and to never touch the surface of the artwork. Finished pastel artwork is generally framed behind glass. Don't ever use Plexiglass because the Plexi will act as a magnet and attract the loose pastel particles, creating a "ghosting" effect on the inside of the Plexi. If you used an Ampersand Pastelbord or a wood panel, framing can be a little tricky. Check out Ampersand's article about how to frame their Pastelbord product. Ampersand also has some suggestions for how to frame and hang wood panels. Finally, you could consider buying a Floaterframe, which is a product designed specifcally for framing wood panels.